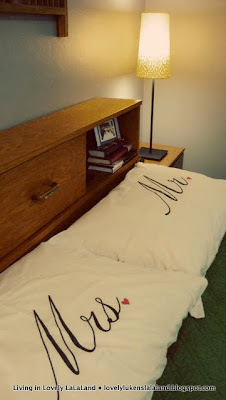 We moved the bed to sit on the wall we originally had it on. Then the window could hold our warm-weather friend, the air conditioner. Someday we'll have central air, but until then we're thankful for the window unit I bought in college. The new Ikea lamps fit better on the small night stands. 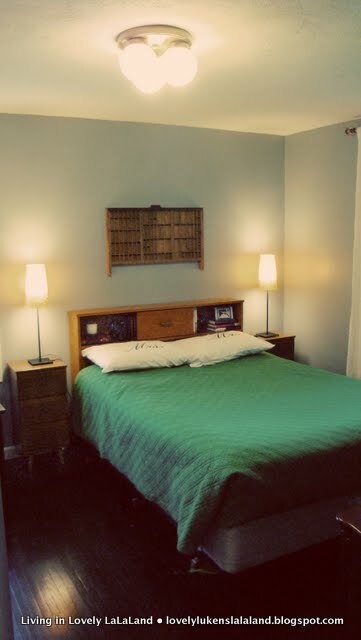 Mike pushed for this change--he disliked how little space was left on the surface around the old lamps. We like the minimalistic feel to the pair of Hemma bases and Skimra shades. And, of course, they were the most affordable option we found. Yay for Ikea's amazingly low prices! The bedspread is also a recent buy. Though we loved our old comforter set--it was a wedding gift from our registry--its dry clean only status meant that I couldn't wash it as easily as a person with allergies (that'd be me) should. The new quilt--found here on Overstock--is cotton and therefore easy to toss in the wash when needed. Another thing we like about the quilt? It's reversible. We can have solid green or buffalo check, depending on our mood. Nice! We also ditched the hanging silver platters and frames. Remember when I mentioned my husband doesn't love gallery walls? The empty type-setter's drawer is much more pleasing to his eye. I also love it, so it's a great compromise. 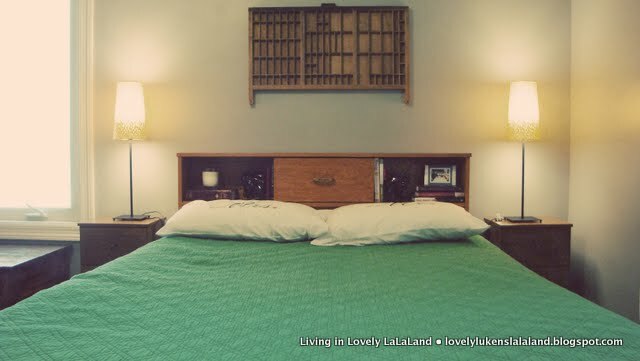 The headboard used to function as a front entry table. We like the additional storage and visual presence it adds to our bed. There's a door-stopper under our wheeled bed frame. We could just remove the wheels, but hate to lose the height. 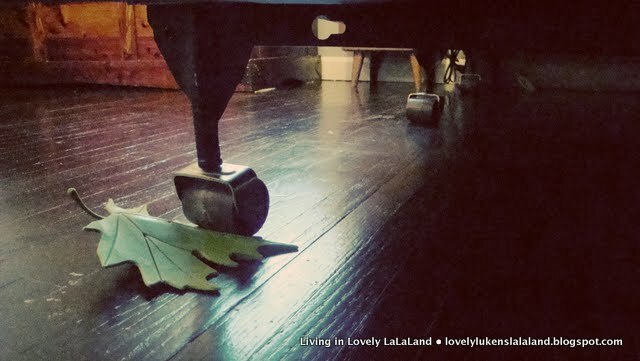 Besides, the green leaf is just so fun. 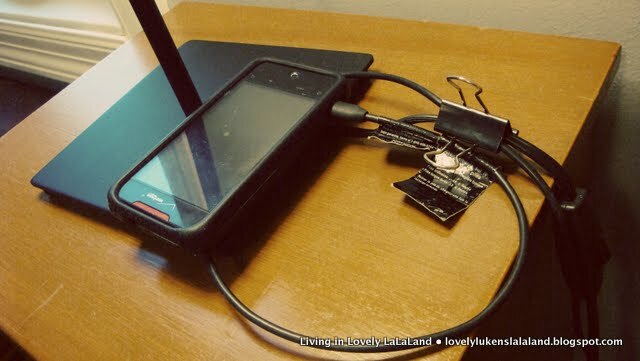 We charge our phones on our nightstands while sleeping. I clipped the charger cords to the lamp cords so the chargers wouldn't fall to the floor when not in use. It was a little change but we've really appreciated the convenience. This side of the room remains much the same. 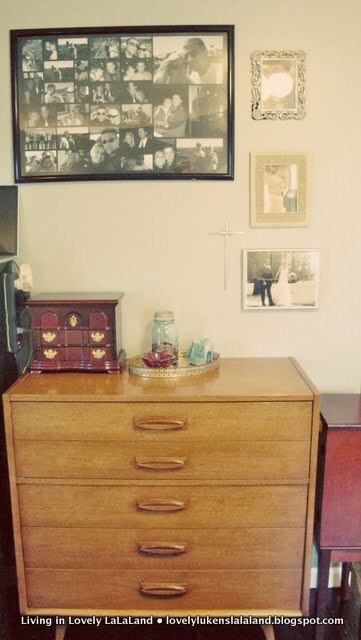 I still love how my great-grandma's chair and lamp pair so well with my giant rummage sale mirror. 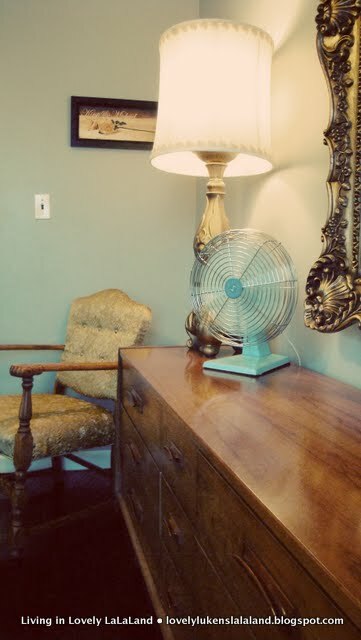 My grandma and I traded one of our new-ish freestanding fans for her vintage table fan. Mike actually didn't know about the trade until he saw our former fan at my grandparent's home. He laughed and commented that he didn't know many girls who'd rather trade off her new fan. My Grandma echoed his thoughts. What can I say? I love this little guy. 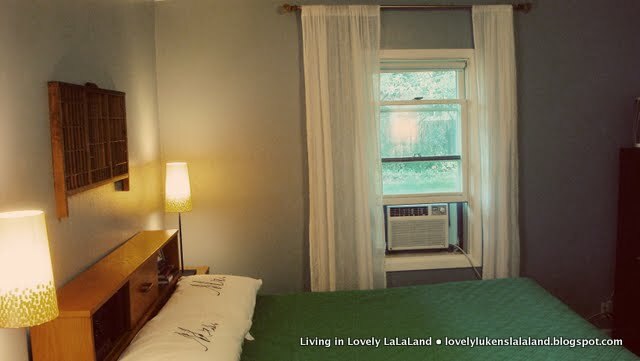 It reminds my childhood and the warm summer nights I spent at her house with my bedroom window open and this fan keeping me cool. Thanks for trading, Grandma! 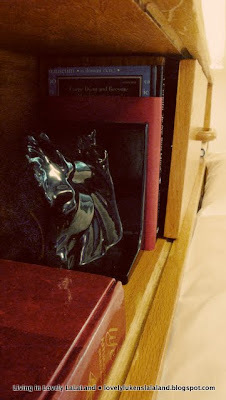 The tall dresser faces our bed. I gave Mike the framed collage for his 23rd birthday--my first birthday gift to him. We have fun reminiscing as we study the photos, all taken during our first months of dating. This tray corrals our pocket items. The bowl holds our wedding bands when they're not on our fingers--in other words, when we're deep into messy DIY projects. The jar has held my husband's change since he was a teen. The blue rock is actually a tea-light holder. It gives off a pretty blue glow when lit. 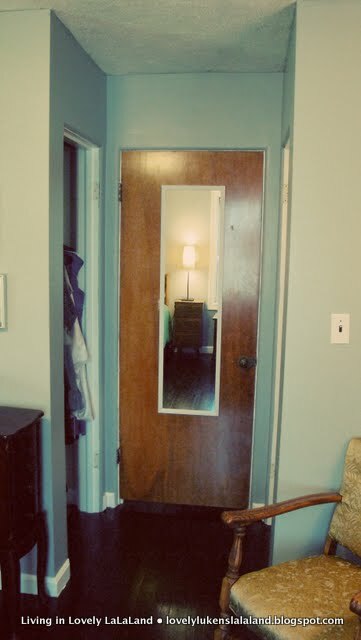 We took off the closet doors on either side of the room's doorway because they both had to be fully closed to enter and leave the room. They were a pain. We're planning to put curtains up but haven't yet. 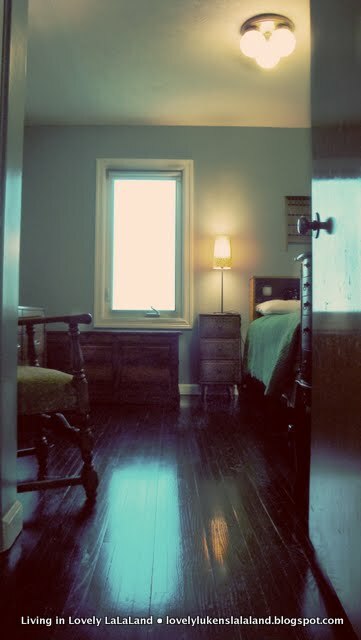 There you have it, a look at our bedroom these days. 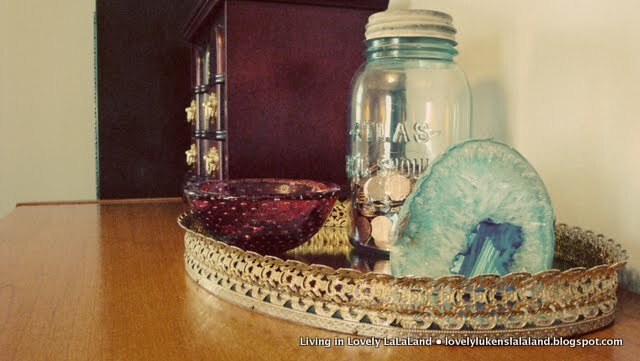 linking up with Thrifty Decor Chic. Please come visit again because my master bedroom is calling your name. Looks gorgeous! 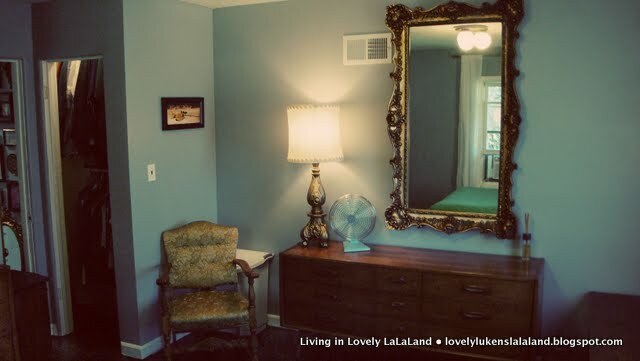 love the wall color and the mirror!! I love that typesetter's drawer. I've been looking for one, too. 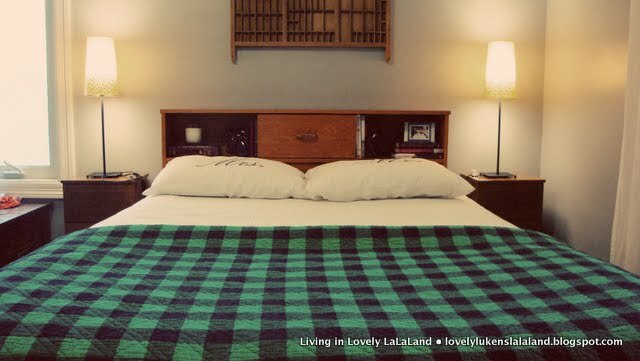 The reversible quilt is super cute and the check is perfect for fall/winter. Everything looks great.